This Christian movie is made possible by PureFlix Entertainment, the creators of God’s Not Dead, I’m Not Ashamed and others successful Christian movies. Just by knowing that PureFlix had produced this film, I was indeed intrigued by it when it was released. What I quickly noticed when watching Do You Believe? Is that the movie has different storylines, different people who are going through different troubles but like it’s shown in the God’s Not Dead movies, somehow those storylines and characters are connected. All these characters are going in different directions but they all want a change and need something more. By all the characters be connected somehow, the final theme and lesson are one. Do You Believe? Is about a pastor who is impacted when seeing a man preaching out on the street and becomes reminded that to truly believe is to act. This realization kick-starts a journey with him and those around him as well as God puts the pieces of the puzzle together. This film has a star-studded cast to fill in the shoes of these characters like Sean Astin, Ted McGinley, Cybill Sheperd, Alexa PenaVega, Lee Majors, Madison Pettis and many others. Like I mentioned before, during this Christian movie we meet many characters with different troubles, for example we meet a couple who years before lost their only daughter, a preacher and his wife who are unable to have a child, a young teenage mother-to-be set who is scared of the thought of raising a child alone, a soldier who returns home with intense effects of PTSD, a suicidal woman who longs to reconcile with her dad, a little girl and her mom who are dealing with the ordeal of suddenly being without a home, a troubled street gang member, just to name a few. At the beginning of Do You Believe? We meet Matthew (played by Ted McGinley), a local pastor who in the street is confronted by a man who is preaching the Gospel with a cross in his back. The man explains what he thinks about the cross and his ultimate faith shines through and impacts Matthew’s life. Making him think about what’s the meaning of the cross for him and his belief. Back in front of his congregation, Matthew decides to give a sermon on the same subject, the cross. 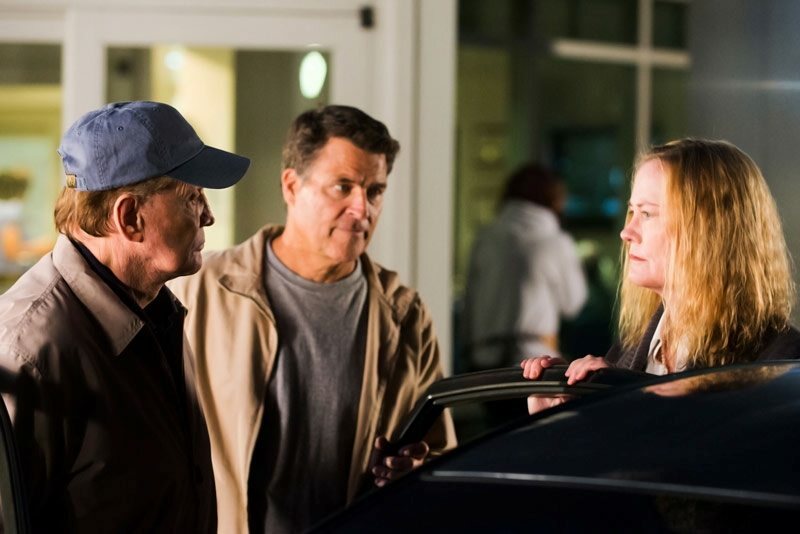 We also meet one of the older couples represented in the movie, JD (played by Lee Majors) and his wife Terry (played by Cybill Sheperd) who are still suffering the loss of their daughter Kathleen a few years back and are set on leaving her room just as she left it the day she passed on. Later on, we see how mom Samantha and her daughter Lily become homeless and while looking for a plate of food they end up at the Salvation Army where Terry and JD are serving. This is an example of how these stories connect in some way. Seeing Samantha and Lily as they intend to sleep in their car, JD invites them over to his and his wife’s home. Little Lily knows that this is the works of God and thanks Him. Instantly Terry feels a deep connection with Lily and especially Samantha. Also in Do You Believe? We meet Pretty Boy, a member of a street gang who suddenly finds the message of God when entering a church after running away from the police. What message does he hear that makes him believe? Well, Pastor Matthew’s message about the cross I mentioned before. Even though Pretty Boy is set to make a change in his life, there is much opposition specifically from his brother Kriminal, also a gang member. As viewers, we also witness Carlos’ story. He’s a veteran, a Marine to be exact who lives his life with so much guilt but when he sees a woman about to end her life in a bridge, he goes to save her from committing a mistake and somehow they feel identified with each other. The theme of this movie is belief. It displays a great message about believing in spite of everything. That even though if things aren’t going well or end up in tragedy, God is orchestrating everything for good and has a perfect plan. Even though we might not understand it, He sees the bigger picture.